(BANGUI, Central African Republic) - Rebels killed four soldiers and captured an unknown number of troops in an attack on Birao, the main town of northern Central Africa Republic, the military said on Thursday. Rebels belonging to the Convention of Patriots for Justice and Peace were still in control of the key town after forcing government troops to withdraw, a military commander told AFP. "The rebels killed four of our soldiers and wounded some other," he said, declining to be named. "A certain number of our men were also taken prisoner but we have no exact figures on that." He said reinforcements were on the way to the area and a counter-attack was planned. 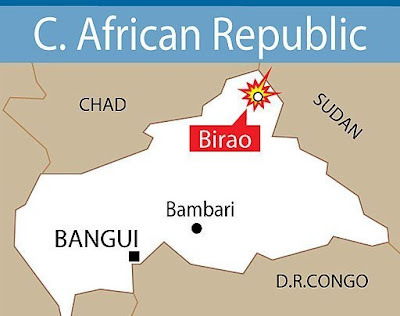 Birao is a garrison town near the borders with Chad and Sudan in an area where attacks by rebel groups occur with regularity. Rebels of the Lord's Resistance Army staged a raid on the town in October, looting shops and abducting a number of women. The CPJP has not signed peace accords with the government of President Francois Bozize, unlike most rebel movements in the desperately poor landlocked nation. The CPJP's founding leader is former government minister Charles Massi. His relatives and aides say that Massi was detained in neighbouring Chad, handed over and tortured to death in January in a Central African prison. Rebels in the Central African Republic have taken over the town of Birao after heavy fighting with the army, a UN official has told the BBC. The CPJP rebels have seized key strategic places including the armed forces' command base and the airport. Birao had been under UN guard since June but the peace mission ended two weeks ago. No casualty figures have been released but one humanitarian worker was killed during the attack, the official said. The head of the UN humanitarian agency in CAR, Jean-Sebastien Munie said a large number of rebels led the attack on Thursday. "The rebels' attack took the national forces by surprise." The CPJP rebels are the only militia which remains outside the country's peace process. Birao lies in a highly unstable region near the borders with Sudan and Chad, both of which have several rebel groups of their own.